As The Greens NSW Senate pre-selection campaign starts, it can be difficult to see the politics through the fog of official statements. But as Solidarity argued last month, this is not a personal contest between Lee Rhiannon and Mehreen Faruqi. Mehreen Faruqi’s website says she stands for, “A member-led party: Defend real grassroots democracy in the Greens”. How can anyone object to that? But in the context of the pre-selection, Faruqi’s use of “real” is code. The NSW Greens already have “real grassroots democracy”—that is the ability of the membership to bind members of parliament to vote for party policy. It was that democracy that Richard Di Natale and the federal Party Room so strongly objected to when Lee Rhiannon indicated that she would vote against Gonski 2.0. The ability of the party membership to discipline its MPs is a fundamental question of left politics. Without that, party policy is actually determined by the MPs. To the federal Greens politicians who thought it was clever to stitch up a deal with Turnbull over Gonski 2.0, the policy of the NSW branch was an obstacle to their wheeling and dealing. The right-wing NSW Greens MPs like Justin Field and Jeremy Buckingham do not support grassroots democracy; they support Di Natale. Buckingham has contempt for the State Delegates Council and rejects any idea that a Greens MP should be accountable to party policy and the party membership. He talks about “democracy” but he rejects anything that would hold MPs to account—a point he repeated in the recent Four Corners episode which showcased the right wing of the party and their willingness to openly attack Rhiannon and the left. The right is backing Faruqi because it is their best chance of removing Rhiannon and striking a blow against the left. Regardless of Faruqi’s political record, by relying on their support to win the Senate spot, she has sold herself to the right. Faruqi’s allegiance in the campaign has been revealed by her strategic trips to local groups controlled by the right like the recent meet-and-greet in Byron. She makes a point of being seen with active members of the right; door-knocking for marriage equality with Justin Alick and Jack Gough, a staffer in Buckingham’s office. Faruqi asks members to vote for her to, “Unify our progressive movement”, but she means “unity with the right”. Trying to win support in the preselection by arguing that a vote for Rhiannon will allow The Greens to keep Faruqi in state politics and she have her available as a future Senate candidate misunderstands the importance of the left winning on a clear political basis of building an activist party. Rhiannon is not going to win, and the left is not going to win, by papering over differences or fudging the question that has been sharply posed by Di Natale’s attack—what kind of party should The Greens be? There is not a word in Faruqi’s pre-selection video of what is needed most in federal politics—a determination to fight the Turnbull government and all that it stands for. What is needed is a party that is more than the voice of the unions and the social movements; we need a party that is of the social movements; movements that are built outside parliament. The green bans that were an inspiration for the formation of the NSW Greens were bans based on industrial action by builder’s labourers. The Greens support the right to strike, but it will be industrial action in defiance of the law that will win the right to strike, not a vote in parliament. 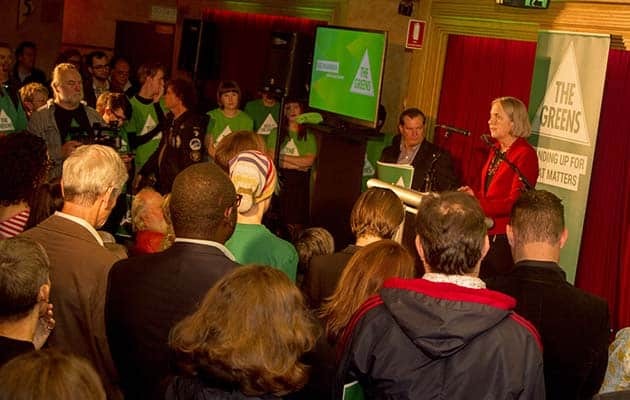 At the moment, The Greens’ party apparatus organises almost exclusively around elections. Di Natale and the right want to keep it that way. But there is the possibility of building a committed left-wing party that builds in the unions, and campaigns on issues like inequality, jobs and penalty rates, as well as refugees, climate and the environment. That’s why Lee Rhiannon’s campaign matters for the future of the left.